Notable to aquarists and divers alike as being beautiful, fragile and slightly to highly toxic to the touch! Watch your hands underwater... and don't touch your mucus membranes w/o washing your hands after diving or working in your tanks. Ouch! Hydrozoans are the "other" Class of cnidarians (Anthozoans making up the mainly Polypoid corals, anemones, sea fans... and Scyphozoans the "real" Jellyfishes that live most of their lives as medusas, inverted bell-shapes). Most of the Hydrozoans are small, obscure not-so funny to touch Christmas tree sort of affairs, but they include such notables as Portuguese Man of War, Fire Corals (Millepora), and the beautiful delicate Stylasterines (Lace Corals) amongst their ranks. These are colonial animals, sometimes a branch per colony, other times a specialized part (like the "Sail" in the Man 'O War...). 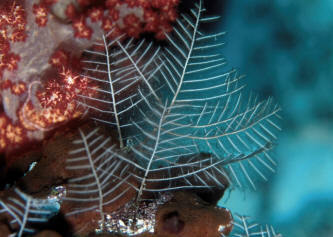 Order Hydroida: Hydroids, the most common Hydrozoans. Most are "tree-like" in shape with their stinging cells much like small leaves or ornaments. 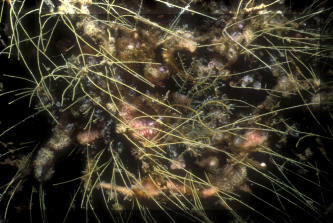 Most reproduce sexually, with mature attached colonies releasing small medusae that form at the base of their "branches"... these swim off producing either eggs or sperm, that if joined, metamorphose into a planula larval form that if fortunate, is blown by currents to a suitable reef surface and attaches, becoming a new branched colony. Aglaophenia cupressina Lamouroux 1812, Feather Hydroid. Indo-Pacific. To about two feet in height. Zooplankton filter feeder. Occurs in whitish and tan varieties. A colony in Australia and one showing reproductive structures in N. Sulawesi. 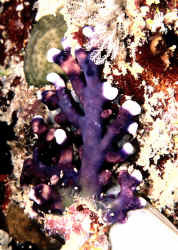 Antennellopsis sp. Very narrow single strand colonies. N. Sulawesi images. Gymnangium hians (Busk 1852), Feather Hydroid. Found in areas of good current on underhangs, in caves (pukas). Gray to light brown in color. 2-3 inches in length. Indo-Pacific. Hawaii pix.